The series uses four principal elements: rarely seen contemporary colour and monochrome film from archives, interviews with survivors such as Dario Gabbai and former Nazis such as Oskar Gröning, computer-generated reconstructions of long-demolished buildings as well as detailed, historically accurate re-enactments of meetings and other events. These are linked by modern footage of locations in and around the site of the Auschwitz camp. There is no screenwriter… Every single word that is spoken is double — and in some cases triple — sourced from historical records. This reflects the conception of the earlier BBC/HBO film Conspiracy, which similarly recreates the Wannsee Conference (an event briefly portrayed in programme 2 of this series) based on a copy of the minutes kept by one of the attendees, although that film also includes speculative dramatised sections. The computer-generated reconstructions used architectural plans that only became available in the 1990s when the archives of the former Soviet Union became accessible to Western historians. The discovery of these plans is described in the 1994 BBC Horizon documentary Auschwitz: The Blueprints of Genocide. Main Theme: Harpsichord Suite No. 4 in D minor, HWV 437, composed by Handel, for the DVD Menu & End Credits. Piano Trio No. 2 (Schubert), composed by Schubert. The Twins (Prague), composed by Max Richter. The last episode of the series also features Introitus from Mozart's Requiem in D minor, which is played just before the ending credits start to roll. Released on Region 2 DVD by BBC Video on 2005-02-14. Also included in the BBC World War II DVD Collection. Rees, Laurence (6 January 2005). Auschwitz: The Nazis and the 'Final Solution'. BBC Books. ISBN 978-0-563-52296-6. Rees, Laurence (4 January 2005). Auschwitz: A New History. Public Affairs Books. ISBN 978-1-58648-303-6. ^ Duke, Katy (14 February 2005). "BBC documentary prompts war crimes investigation". The Guardian. London. Retrieved 28 April 2018. ^ "Auschwitz: Inside the Nazi State: About This Series" (Web). Copyright © 2004-2005 Community Television of Southern California (KCET), (BBC and Public Broadcasting Service (PBS) member Public television). All rights reserved. Archived from the original on 24 July 2008. Retrieved 30 August 2008. ^ a b "Auschwitz: Inside the Nazi State". BBC Warner (dist. PBS Video). 29 March 2005. ains 400. Retrieved 30 August 2008. ^ "Hearts of Darkness". The Sydney Morning Herald. 29 September 2005. 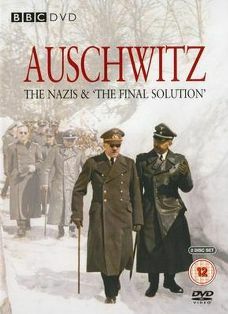 ^ "Auschwitz: The Nazis and 'The Final Solution'". BBC. 14 February 2005. Archived from the original on 1 September 2008. Retrieved 22 July 2008. ^ "The World War Two Collection". BBC. 25 April 2005. Retrieved 22 July 2008. ^ "Auschwitz: The Nazis and the Final Solution". Netflix. Retrieved 15 September 2017. This page was last edited on 10 January 2019, at 15:19 (UTC).